As you drive from Pasco on Kahlotus Highway to T&R Farms, it feels like you’re seeing a calendar collage featuring the picturesque countryside of eastern Washington. Each bend in the road offers yet another rich vista: rolling hills as far as you can see, green with new wheat; statuesque barns; complex farm machinery dotting the landscape; and of course, the huge irrigation systems that make farming so bountiful in our region. The drive takes you to a lovely farm house surrounded by beautiful trees, complete with a white picket fence. The perfect place for a calendar photoshoot. In fact, T&R Farms is a calendar shot. The John Deere company selected it as a featured enterprise for its 2015 promotional calendar—an excellent choice and an honor to all those associated with it. 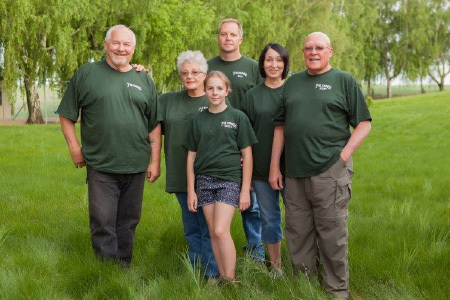 The success of T&R Farms has been the life work of two very special people to the Three Rivers Community Foundation (3RCF), Rella and Ron Reimann. As a young couple, Ron and Rella returned to their farming roots after Ron came home from the Viet Nam war. They formed a partnership with her twin brother, Porky. Thomsen and Reimann—the T and the R of the farms—eventually formed a corporation with Rella’s father Haakon Thomsen and moved to Franklin County in 1973. They chose their current location in Poverty Flats, so named because it was such a low-yielding area. Old maps still show that name, according to Ron. With irrigation, the land turned into an amazingly rich and high yielding area. Over the years, T&R Farms expanded to today’s megafarm, growing potatoes, wheat, corn, and more as well as cultivating apple orchards. The farmed land stretches from Bugaboo Hill behind Ron and Rella’s home to the majestic Snake River and surrounding valley. And there’s a tidbit of history: Bugaboo Hill, settled in the early 1900s in the middle of Poverty Flats, earned its name because whether an old Model A broke down trying to climb it or another mishap took place, there always seemed to be some “bugaboo” that would befall those who attempted the trip. Hard work and innovation. Rella, who has a degree in vocal music and piano, taught music for many years in addition to helping with farm work. With a business and economics degree, Ron became interested in technology, particularly in irrigation technology. In 1981 he teamed with Nelson sprinkler systems to develop a variable pressure irrigation system. As a result,T&R Farms became one of the first to be involved with neutron-probe water-use testing. They were inducted into the Ag Hall of Fame in 2001 for their innovative water savings methods. Combined with computer technology, this led to systems that could vary the amount of water sprayed, depending on the moisture levels in the ground. This process has saved millions of gallons of water pumped from the Snake River. Such advances have revolutionized the farming industry. Today, almost every aspect of farming revolves around computerization, even self-steering tractors—as well as processes for planting, fertilizing, irrigating, scheduling, harvesting, shipping, tracking, and complying with the many federal requirements. It is, indeed, an enterprise. Ron and Rella’s son Reid, a partner in T&R Farms, is in the process of buying the farms, ensuring that family traditions are carried on. 3RCF founding member. Rella helped to found the Three Rivers Community Foundation in 1999 and still serves on our Board. Both Rella and Ron read grant applications each year and decide together what to support. “I never knew there was so much need in our community,” Ron says. Through the Three Rivers Community Foundation, their money goes a long way. Their favorite projects include work by the American Legion, the Boys & Girls Clubs, and the After School Matters program. The Reimanns say they could not be more satisfied with the work of the Three Rivers Community Foundation. They appreciate the low administration costs as well as efficiencies of screening applicants, limiting duplication of projects, and evaluating how money is spent.